In the 1920s through 1940s, the enigmatic and charismatic John Graham (1886–1961) and his circle of New York artists, which included Stuart Davis, Arshile Gorky, and Willem de Kooning, helped redefine ideas of what painting and sculpture could be. They, along with others in Graham’s orbit, such as Jackson Pollock and David Smith, played a critical role in developing and defining American modernism. American Vanguards showcases more than sixty works of art from this vital period that demonstrate the inter-connections, common sources, and shared stimuli among the members of Graham’s circle. 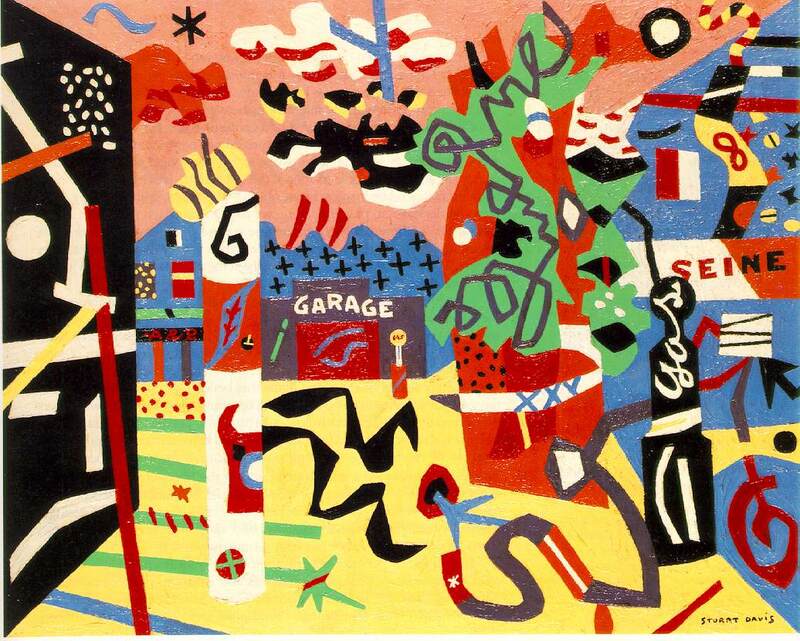 Stuart Davis grew up in an artistic environment, for his father was art director of a Philadelphia newspaper, who had employed Luks, Glackens, and other members of the Eight. He studied with Robert Henri 1910-13, made covers and drawings for the social realist periodical The Masses, which was associated with the Ash-Can School, and exhibited watercolors in the Armory Show, which made an overwhelming impact on him. After a visit to Paris in 1928-29 he introduced a new note into US Cubism, basing himself on its Synthetic rather than its Analytical phase. Using natural forms, particularly forms suggesting the characteristic environment of American life, he rearranged them into flat poster-like patterns with precise outlines and sharply contrasting colors. He later went over to pure abstract patterns, into which he often introduced lettering, suggestions of advertisements, posters, etc. Arshile Gorky settled in New York City in 1924, and enrolled at the National Academy of Design and the Grand Central School of Art (where he also became an instructor). Despite having some formal art training, Gorky was essentially self-taught, and obtained most of his education through visits to museums and galleries and reading art books and magazines. By doing so, Gorky became familiar with avant-garde European art and embarked on a systematic study of its masters, most notably Paul Cézanne, Pablo Picasso, and Joan Miró. To friends and colleagues who criticized his borrowings as having a lack of originality, Gorky stressed the importance of tradition and continuity, maintaining that an artist can mature only after having experienced a period of apprenticeship. In 1938, probably under the influence of Arshile Gorky, Willem de Kooning embarked on a series of male figures, including Two Men Standing, Man, and Seated Figure (Classic Male), while simultaneously embarking on a more purist series of lyrically colored abstractions, such as Pink Landscape and Elegy. As his work progressed, the heightened colors and elegant lines of the abstractions began to creep into the more figurative works, and the coincidence of figures and abstractions continued well into the 1940s. This period includes the representational but somewhat geometricized Woman and Standing Man, along with numerous untitled abstractions whose biomorphic forms increasingly suggest the presence of figures. By about 1945 the two tendencies seemed to fuse perfectly in Pink Angels. During the 1940s, he became increasingly identified with the Abstract Expressionist movement and was recognized as one of its leaders into the mid-1950s, while notoriously stating: "It is disastrous to name ourselves. This exhibition, curated by notable scholars William C. Agee, Irving Sandler, and Karen Wilkin, will be accompanied by a fully illustrated catalogue co-published by the Addison and Yale University Press. This critical reconsideration sheds new light on the New York School, Abstract Expressionism, and the vitality of American modernism between the two world wars. American Vanguards: Graham, Davis, Gorky, de Kooning, and Their Circle, 1927–1942 is organized by the Addison Gallery of American Art, Phillips Academy, Andover, Massachusetts.